The season is over for the Washington Nationals, after a heartbreaking 4-3 loss after midnight Friday to the Los Angeles Dodgers. 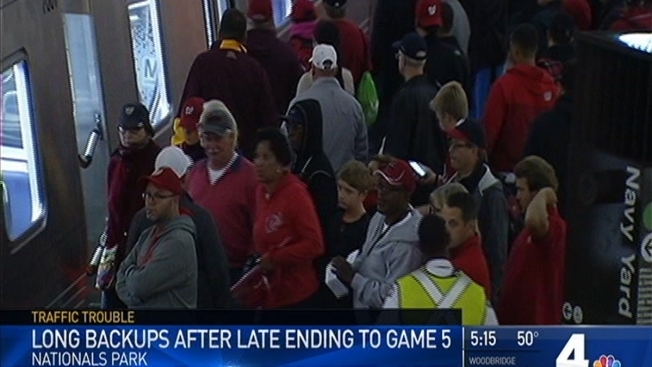 Nats fans left Nationals Park with heavy hearts. "I'm done. I'm moving to Cleveland." "D.C. sports are so depressing." That's what fans told News4's Carol Maloney. A little past midnight in Game 5 of the NL Division Series, the Dodgers' Clayton Kershaw emerged from the bullpen to pitch in relief for the first time in seven years. Two outs later, the only save of his major league career in the books, Kershaw's arms were raised and teammates were rushing to celebrate with a guy whose postseason performances have never carried the luster of his regular-season success. Coming in after closer Kenley Jansen entered in the seventh inning and threw a career-high 51 pitches but issued a pair of one-out walks in the ninth, Kershaw got Daniel Murphy to pop out, then struck out Wilmer Difo to end it. That finished the Los Angeles Dodgers' dramatic 4-3 victory over the Washington Nationals that decided their NLDS. "It's tough to take, but you have to be proud of what they accomplished," manager Dusty Baker said. Outfielder Jayson Werth said we wasn't ready for the season to end. "It stings right now, to be in the situation, to be heading home and feel like you got so much still in you to play," he said, dejected. The Dodgers won the last two games of the best-of-five NLDS with Kershaw pitching in each and now head to the NL Championship Series to face the Chicago Cubs. That opens at Wrigley Field on Saturday night. The Nationals, meanwhile, still have never won a postseason series, winning three NL East titles in the past five years but losing in the NLDS each time. And while there's no way Kershaw will be available for Game 1 against Chicago, one thing's for sure: Whatever notion there might have been about the lefty's playoff problems -- he was 2-6 in the postseason until this series, with an ERA nearly twice what he has in the regular season -- is now a thing of the past. "That (criticism) is ridiculous,'' Dodgers President Stan Kasten said, his dress shirt soaked with alcohol from the postgame festivities. "That's why I said to him, 'Dude, you're Mr. October.'" Kershaw worked two days after throwing 110 pitches over 6 2/3 innings in Game 4, when he had the benefit of only three days' rest following his win in the opener against the Nationals. How unanticipated was this work as a reliever? Several hours before Thursday's game began, Dodgers first-year manager Dave Roberts was asked whether Kershaw might be available at all -- maybe just for one out, say? "No,'' came Roberts' reply. "Absolutely not." Kershaw came in after Jansen got a career-high seven outs. Jansen walked Bryce Harper and Werth with one out in the ninth - and that's when Roberts went to Kershaw. Kershaw wound up with his second pro save. His other came on Aug. 19, 2006, in the Gulf Coast League in a game against the Nationals' rookie club. And Kershaw's catcher that day a decade ago? Amazingly, none other than Jansen, who didn't begin pitching professionally until three years later. Jansen said he couldn't recall that particular game. He assured everyone he'll never forget this one. When Kershaw walked from the dugout to the bullpen before removing his blue jacket to start warming up, he got fist bumps from teammates. In the tunnel that leads from the dugout to the visiting clubhouse, Jansen looked up at a TV and saw Kershaw getting ready to pitch. LA's scoring all came in a four-run seventh off six Nationals pitchers, including Joc Pederson's homer off Max Scherzer. Washington was leading 1-0 in the sixth, when Werth walked and Ryan Zimmerman smacked a two-out double to left. But third-base coach Bob Henley - whose propensity for waving runners home led to a popular T-shirt among Nationals players that says, "Send `em short, send `em tall, send `em one, send `em all''- sent Werth and saw him get thrown out easily on shortstop Corey Seager's relay. "You live and die by those moments, sometimes,'' Werth said. And in the sort of blink-and-you-missed-it game-shifting sequence, Werth's inning-ending, overzealous bid to score was followed immediately by Pederson's homer on Scherzer's first - and, it turned out, only - pitch of the seventh. That began a rally that included a pinch-hit RBI single by 37-year-old pinch hitter Carlos Ruiz , helping LA go up 4-1. Then came pinch hitter Chris Heisey's two-run homer in the Washington seventh. Then came Jansen in an inning that took 66 minutes and included a total of eight pitchers. The West champion Dodgers are back in the NLCS for the first time since 2013, but they've lost in their past three trips to that round, failing to make it to the World Series since they won their most recent championship in 1988. And Kershaw had a hand in all three NLDS wins. "Looking him in the eye, I felt good about it, and the training staff gave the OK," Roberts said, "so it's only fitting for Clayton to get the last out right there."